If you’re a busy dog owner and you’d prefer to ration your time out for walks and a quick game of fetch instead of worrying about consistent feed schedules, a good automated food dispenser is, well, indispensable. Whether you’re looking for value, smart phone compatibility, peace of mind, or just cool gadgetry, we’ve got the best picks for you. It’s hard to find an automated dog food dispenser that’s reasonably priced, yet still safe and reliable. 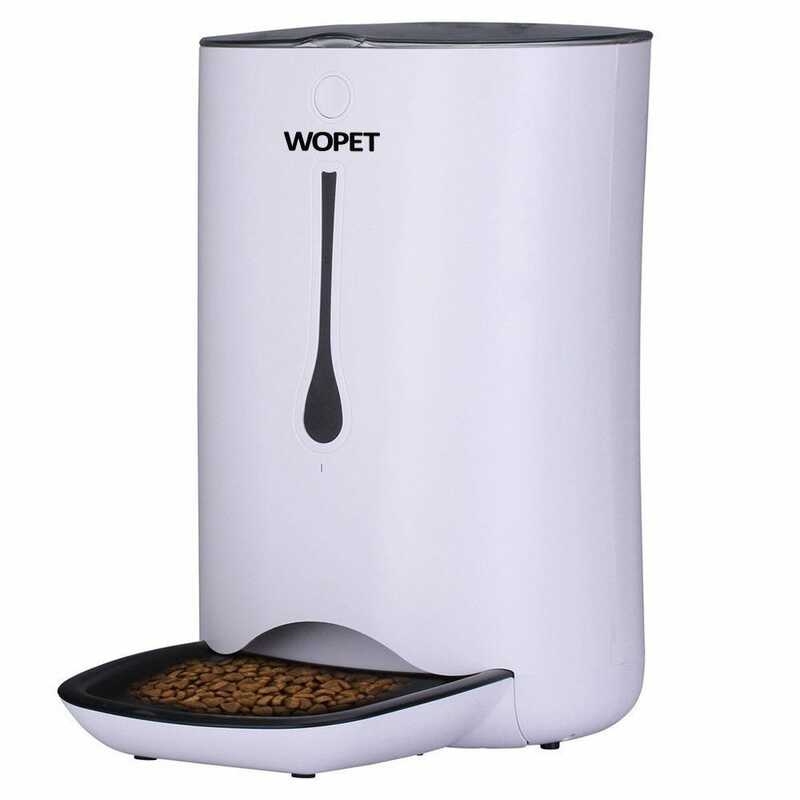 The WOpet Pet Feeder gets the job done and isn’t too terribly expensive. The programmable timer can be set to dispense food up to four times per day in portions from 2 teaspoons to 4.5 cups in a serving. And since you’re not there, you don’t have to worry about your dog missing a meal due to technical difficulties—the WOpet is wall-powered and battery-powered in case of power outages. Now that you don’t have to worry, but what about your dog? If he misses you during the day, you can record a message that plays during feedings so he can hear your voice (which is a great feature for dogs who have separation anxiety). The feeder is for dry kibble only and features a locking lid so crafty dogs can’t break into the food reserves when you’re away. In this day and age, what can’t be connected to our phones? The Feed and Go Smart Pet Feeder is an automatic food dispenser that can be controlled with an app on your Andriod, iOS, or Windows smartphone. Watch your dog eat via the camera on the feeder (as long as your feeder is connected to Wi-Fi), or even schedule feedings. Whether you want to trigger one feeding session or regular meals, just click the button on your app and you’re good to go. If you have more than one dog, you can purchase multiple Feed and Go feeders and control them from the same app. That way, all of your dogs can get perfectly portioned meals at the right time—although good luck policing who eats from what dish when you’re not there to supervise! Wet food or dry, treats, or even medication—you can put what your dog needs in any of the 6 compartments (each compartment holds up to 8 ounces, just don’t keep wet food in for more than 24 hours). Finally, if the feeder is offline or the Wi-Fi cuts off, the Feed and Go still feeds as scheduled. You can have peace of mind knowing your dog can have up to 12 consistent meals with the PetSafe Automatic Feeder, which also is durable enough so that your dog won’t break into the dispenser. The PetSafe’s locking lid keeps paws out and food fresh. 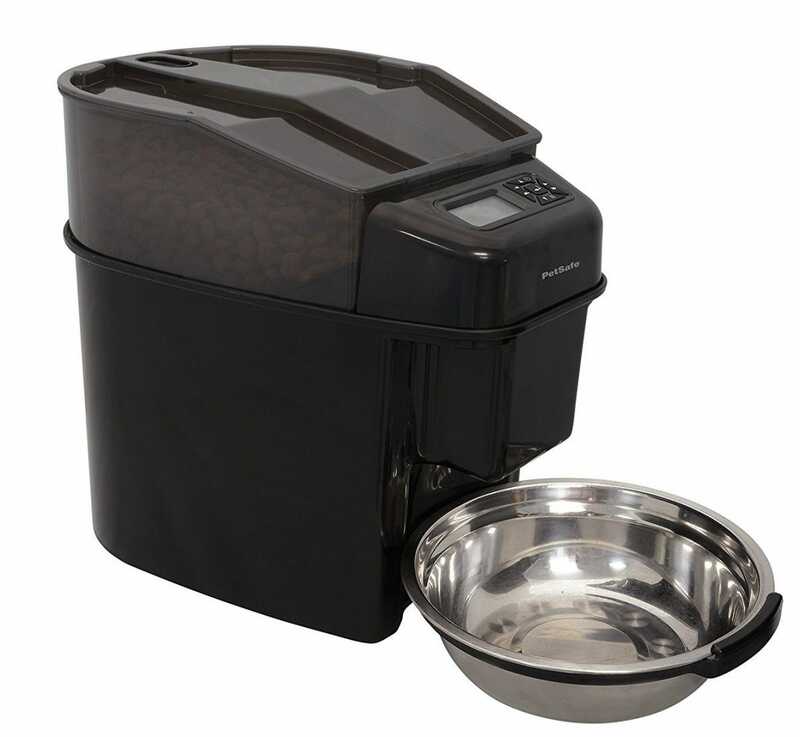 With a 24-cup capacity and a digital timer that portions food from ⅛ cup to 4 cups, this feeder is perfect for both small and large dogs. The PetSafe is battery operated but the power adapter can be purchased separately for those worried about the power going out. You also don’t need to rely on Wi-Fi to make sure your dog’s feeding is on schedule—just program the schedule directly on the feeder! For fast eaters, dispense meals over a set period of time to limit the dog swallowing too much air (which prevents vomiting and bloating). 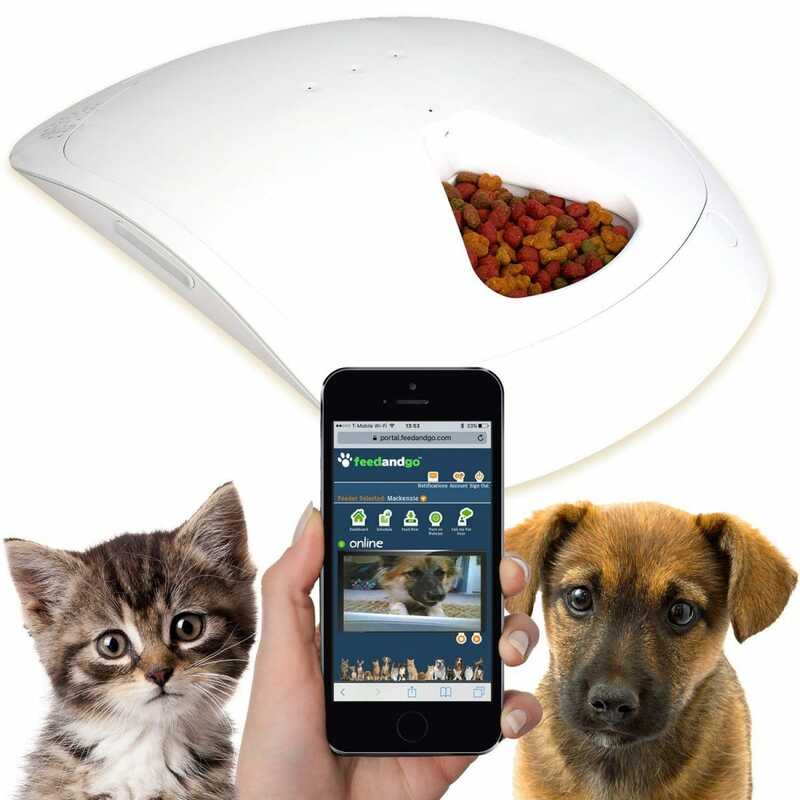 If you are interested in a Wi-Fi-enabled version, check out the PetSafe Smart Feed Automatic Feeder which is compatible with smartphones. If you’re only interested in adding a good camera to your pet setup, check out our previous roundup of pet cams. But if you’re looking for an automatic food dispenser along with a great camera, the Pettom is a solid pick. 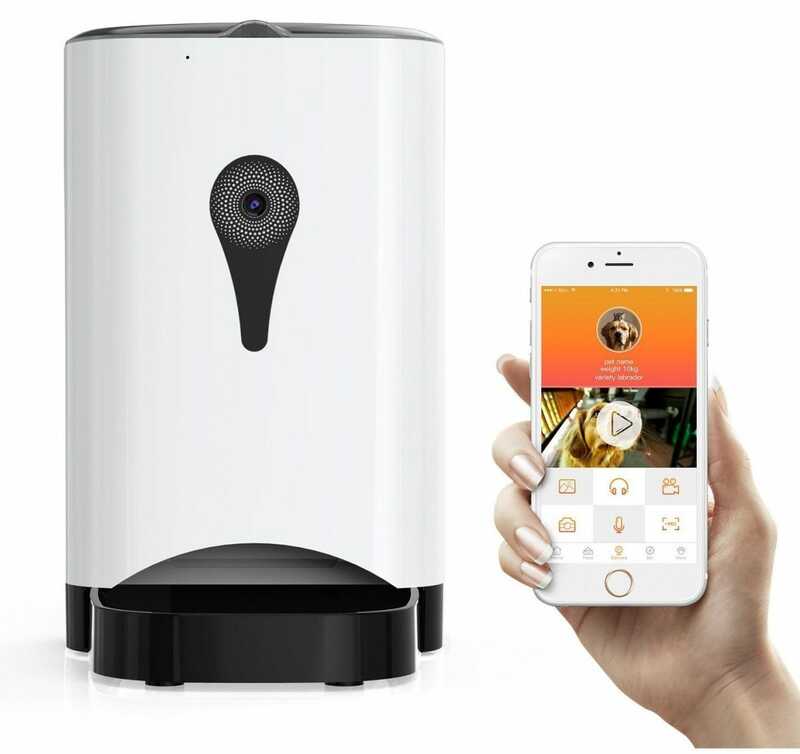 While the Feed and Go feeder also has a camera, it doesn’t do as much as the Pettom’s camera. This camera allows you to take videos, pictures, and have a two-way conversation with your dog. Aside from the camera, this feeder can control your dog’s feeding time and amount, holding up to 18 cups and allowing up to 4 meals a day. And with AC power supply and batteries, you’ll never have to worry about your dog missing a meal.